The Carboniferous Period occurred from about 354 to 290 million years ago during the late Paleozoic Era. The term "Carboniferous" comes from England, in reference to the rich deposits of coal that occur there. These deposits of coal occur throughout northern Europe, Asia, and midwestern and eastern North America. The term "Carboniferous" is used throughout the world to describe this period, although this period has been separated into the Mississippian (Lower Carboniferous) and the Pennsylvanian (Upper Carboniferous) in the United States. This system was adopted to distinguish the coal-bearing layers of the Pennsylvanian from the mostly limestone Mississippian, and is a result of differing stratigraphy on the different continents. 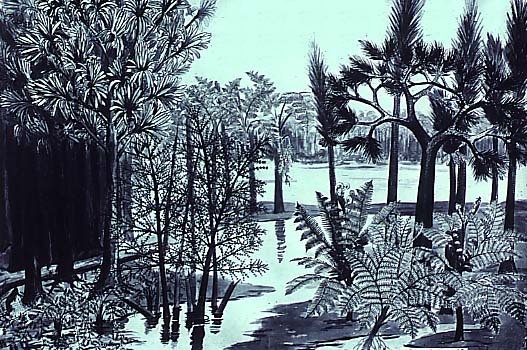 Carboniferous Forest : The Carboniferous Period is famous for its vast coal swamps, such as the one depicted here. Such swamps produced the coal from which the term "Carboniferous", or "carbon-bearing" comes. In addition to having the ideal conditions for the beginnings ofcoal, several major biological, geological, and climatic events occurred during this time. One of the greatest evolutionary innovations of the Carboniferous was the amniote egg, which allowed for the further exploitation of the land by certain tetrapods. The amniote egg allowed the ancestors of birds, mammals, and reptiles to reproduce on land by preventing the desiccation of the embryo inside. There was also a trend towards mild temperatures during theCarboniferous, as evidenced by the decrease in lycopods and large insects and an increase in the number of tree ferns. Geologically, the Late Carboniferous collision of Laurussia (present-day Europe and North America) into Godwanaland (present-day Africa and South America) produced the Appalachian mountain belt of eastern North America and the Hercynian Mountains in the United Kingdom. A further collision of Siberia and eastern Europe created the Ural Mountains. The stratigraphy of the Lower Carboniferous can be easilydistinguished from that of the Upper Carboniferous. The environment of the Lower Carboniferous in North America was heavily marine, when seas covered parts of the continents. As a result, most of the mineral found in Lower Carboniferous is limestone, which are composed of the remains of crinoids, lime-encrusted green algae, or calcium carbonate shaped by waves. The North American Upper Carboniferous environment was alternately terrestrialand marine, with the transgression and regression of the seas caused by glaciation. These environmental conditions, with the vast amount of plant material provided by the extensive coal forests, allowed for the production of coal. Plant material did not decay when the seas covered them and pressure and heat eventually built up over the millions of years to transform the plant material to coal. Click on the buttons below to learn more about the Carboniferous. The chart at left shows the major subdivisions of the Carboniferous Period.The Lower Carboniferous of Europe corresponds roughly to the Mississippian of North America, and the Middle and Upper Carboniferous are roughly equivalent to the Pennsylvanian. This chart is mapped, to allow you to travel back to the Devonian or forward to the Permian. The Carboniferous Period is part of thePaleozoic Era. For additional Carboniferous pages, visit the Mazon Creek Fossils exhibit from the Illinois State Museum, and the very nice Plant Fossils of West Virginia. Find out more about the Carboniferous paleontology and geology of North America at the Paleontology Portal.